We will need something more than a blog post to understand the environment and how it operates. People from different educational background work at bits and pieces of this puzzle. One of these pieces is metals. It is metals that gave us humans the oxygen needed to survive. We humans and cyanobacteria cannot live together because oxygen is toxic to them. Irrespective of this fact, we both survive and we owe this to iron. Iron not only scavenges oxygen for the cyanobacteria but also helps chemical processes in the human body. Last year, I had been to this exhibition on rocks, minerals, and fossils organized by the University of Mumbai, Centre for Extra-Mural Studies. It felt amazing to see these beautiful things. One of the organizers, who was probably one of the professors there took some extra effort to eradicate superstition. She announced to the public the hazards of believing in the healing powers of these stones. Following is the slideshow of the rocks I saw. Rock is a solid heterogeneous mixture of one or more minerals. 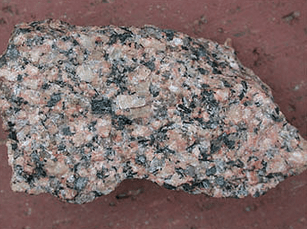 For example, granite is a mixture of the minerals quartz, feldspar, and biotite. A mineral is a naturally occurring solid that has a crystalline structure and a definite chemical formula. For example, gibbsite is a mineral of aluminium with the formula Al(OH)3. An ore is a rock that contains minerals in concentrations that are high enough for economical extraction. 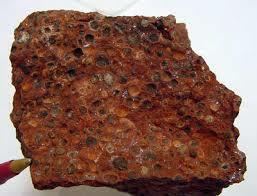 For example, bauxite is an aluminium ore. It is a heterogeneous mixture of various aluminium minerals and other materials such as silica and iron oxides. The ores are then refined to produce the metals such as aluminium that we use in our lives. In summary, rocks contain minerals, which in large concentration are called ores, and these are mined for metals. The yin and the yang of this subject is that there are also toxic heavy metals that are detrimental to the the life on this planet. Heavy metals are naturally present in the earth’s crust just like other metals but what kills is the result of anthropogenic activities such as mining and smelting operations, industrial production and use, and domestic and agricultural use of metals and metal-containing compounds. These activities release unnatural quantities of heavy metals in the surroundings leading to bioaccumulation. A fan of rocks yet? Head over to the Mineralists on Tumblr. Treat your eyes. Previous Previous post: Why do people think drones are a good idea for protecting our environment? Next Next post: Who is an environmentalist? Are you? Am I?